Start your adventure on Day 1 as you arrive at your Jakarta accommodation and meet your group! Tour the city on Day 2 before transferring to Bandung for a traditional music lesson and trek to see a crater lake on Day 3. Take a train to Yogyakarta on Day 4 and tour the city with a visit to Borobudur on Day 5. Discover more stunning temples and history on Day 6 before transferring to Bromo, where you will discover local culture with a homestay. Hike to the the active Bromo Volcano at sunrise before travelling to Banyuwangi on Day 8, stopping at Blitok Beach Fishing Village along the way. Hike the Ijen Volcano on Day 9 before taking a ferry to Bali on Day 10 and ending the day with a seafood beach BBQ in Pulau Merah. On Day 11 snorkel near Menjangan Island and see the Jatiluwih Rice Terraces before ending up in vibrant Ubud. See the highlights of Bali on Day 12 and hike Mt. Abang on Day 13 to watch the sunrise and soak in the hot springs before enjoying your last night out on the town. End your adventure on Day 14 after check-out. Selamat datang, welcome to Indonesia! Make your way to your accommodation where you can get checked in and meet your Bamba Happiness Leader and the rest of your group for an orientation meeting at 6pm. Your accommodation is located in the bustling city center. This evening your tour leader will take your for a 30 minute walk to Jalan Jaksa, the backpackers district full of young people, travellers, lots of restaurants and bars, and tons of energy. We will head to a local restaurant for your first taste of flavourful Javanese food like satays and curries (at your own expense). After dinner we’ll grab a drink at one of the local pubs in this vibrant neighbourhood famous for its nightlife. If you want a late night snack, this is also an ideal place to try martabak, a delicious street food made of stuff and fried flatbreads. Overnight in Jakarta. Enjoy an early breakfast before going on a short Jakarta City Tour. Start with a visit to Batavia, an old colonial town within the city that is currently being restored to its former glory. There are not many places left in Indonesia that still have the magnificent Dutch colonial architecture that you can see here. Next we’ll see the historic Town Square and its monument to Indonesian independence and the Old Harbour full of beautiful historic boats. After the tour we’ll transfer to Bandung, approximately 3 hours away (depending on traffic) where we’ll visit Pak Udjo Angklung Music School, where you will get to interact with local children and observe their music lessons. You’ll even get to try out some of the traditional West Javanese bamboo instruments yourself! Tonight you’ll be staying in Braga, the downtown/central business district of Bandung. For dinner we’ll head to nearby Braga, full of old buildings with amazing historical and architectural merit and a hotspot for restaurants, bars, and cafes. Here you can feast on flavourful Indonesian street food for a real local experience (at your own expense). Overnight in Bandung. 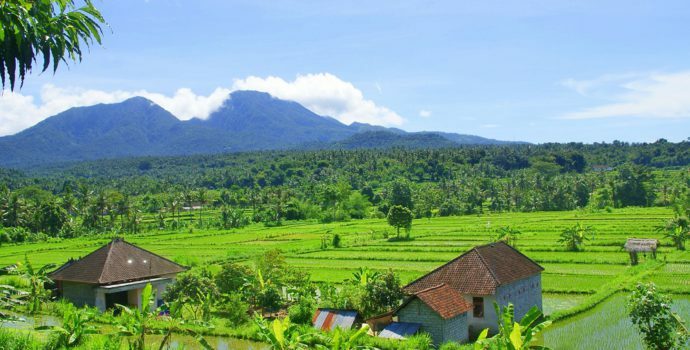 After an early Indonesian breakfast of fried rice or noodles with local bread and fruit we will head out around 7 to visit Batukarut village for a relaxed hike through beautiful rice fields and small Javanese villages. Along the way you can witness the local life of rural people, learn more about the villagers’ customs, and try traditional snacks & drinks, like Pisang rebus and pisang goreng (boiled and fried bananas), kacang rebus (boiled peanuts) and singkong rebus (boiled cassava). Next we will visit the Kawah Putih crater lake, an amazing natural wonder turned a stunning white-blue by sulfur deposits. When we return to Bandung, your tour leader will walk with you to the bustling city center to get dinner at a local restaurant (at your own expense). Tonight you can opt to go with some of your new friends to check out Bandung’s nightlife, famous for its techno clubs and underground bar scene. While this is a Muslim city, it’s one of the most liberal in Indonesia, and at night the streets are full of life. Overnight in Bandung. Today we will enjoy an early breakfast before being dropped off at the railway station for at 8:30am train to Yogyakarta. 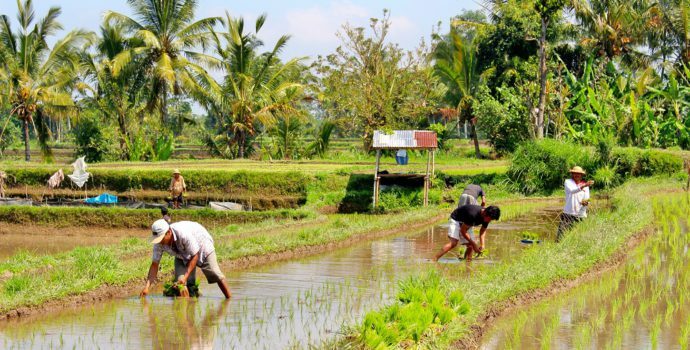 Along the way we’ll pass through traditional villages and rice fields and see how nearly everywhere on Java is crowded with houses, as it is one of the most populated islands in the world. Upon arrival around 5pm you will be picked up at the train station and transferred to your accommodation in the Prawirotaman area for check-in. Tonight you’ll walk with your tour Bamba Happiness Leader to the Malioboro night market, buzzing with life and tons of stalls selling clothes, souvenirs, giving you lots of opportunities to bargain and score some great souvenirs. For dinner we’ll head to a cozy international restaurant where you can enjoy Indonesian cuisine or give your tummy a break with some western-style favorites (at your own expense). Overnight in Yogyakarta. After breakfast, we will make a visit to the Hoshizora Foundation Social Programme in Kalakijo Village, a rural area located in the south of Yogyakarta. Here you will be able to interact with the local children and see the social project’s farm. Talk with the creators of the project about the meaning of their work and how it supports the local community. In Java there is no thing as free public school, so you’ll discover the importance of charity foundations such as this one that helps children raise money for their education. You’ll also have time to relax at our Bamboo Hall & enjoy a traditional lunch at the Socially Responsible Ingkung Kuali Restaurant. Next we will go to explore the beautiful area around Kalakijo by bicycle. The village is well known as a center of batik-making, a process of painting textiles using wax, and you will have the opportunity to learn and try making batik yourself. You’ll see that it’s not as easy as it looks! We will also see how the villagers make Emping, a type of Indonesian chips traditionally handmade in a labour-intensive process. 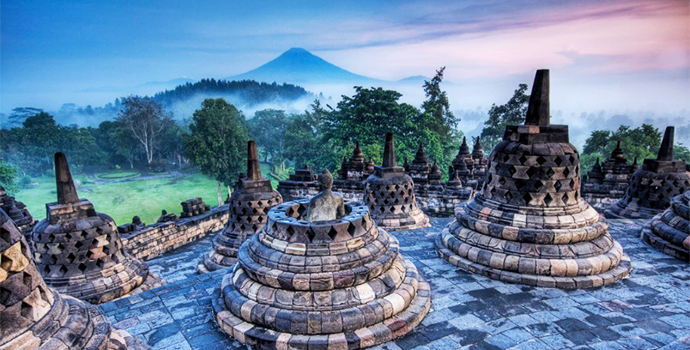 In the afternoon, discover the majestic Borobudur, the world’s largest buddhist temple. After seeing this incredible place, we will also explore the Mendut and Pawon Temples. After the tour we’ll head back to the hotel to relax and hang out with the group before heading out for dinner at a local Mediterranean restaurant in a vibrant part of the city (at your own expense). Overnight in Yogyakarta. In the morning you will enjoy breakfast with the group before your tour leader takes you to visit the Sultan’s Palace, which has been turned into a living museum, as the Sultan or King of Yogyakarta is still alive and resides nearby. Yogyakarta is one of the few places in Indonesia where there is still a regional monarchy, and The Palace is an amazing glimpse into this region’s tradition and culture as it has changed over the course of the last 300 years. On today’s tour you’ll also see the Taman Sari Water Palace, which was once a hammam for the Sultan and his wives. Next we’ll head to the beautiful UNESCO World Heritage temple of Prambanan. 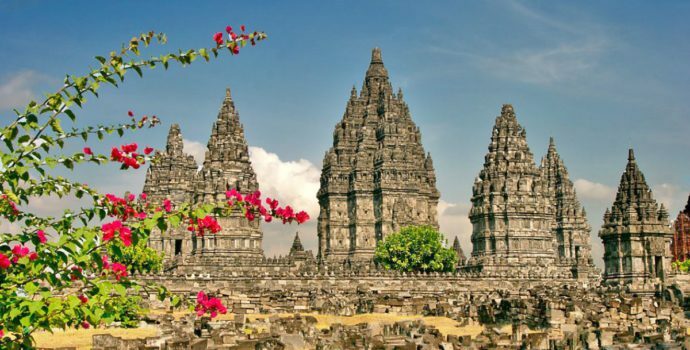 This Hindu temple is small but spectacular and provides an insight into Indonesian history and culture. Next we’ll visit the Sewu and Plaosan Temples, similarly enchanting places. Your tour leader will take you through this spectacular complex of Hindu temples from the 8th century to explain its rich history. In the evening we’ll walk to discover the beautiful Alun Alun Kidul Park, and have dinner at a local restaurant and bar with live music for a fun and vibrant last night in Yogyakarta. This morning we’ll get up bright and early at 5:30am to be transferred to the train station early this morning for a 6:45am transfer to Jombang in an executive / AC class train passing through beautiful landscapes of mountains, rice terraces, and traditional villages. Upon arrival around 11:30, you will be picked up and transferred to Bromo, approximately 4 hours away, passing through tiny roads and villages. Today we will be passing for the first time into East Java, a much more traditional part of the island with less developed cities and stunning views of its many volcanoes. Along the way we will stop to visit Bajang Ratu and Wringin Lawang, two temples that form the Gateway to the Majapahit Kingdom. The buildings are thought to have been built in the 14th century and are one of the great examples of Majapahit’s golden age. Tonight you will stay in a simple homestay in Ngadas Village, where you can immerse yourself in local culture and get to know your host family. 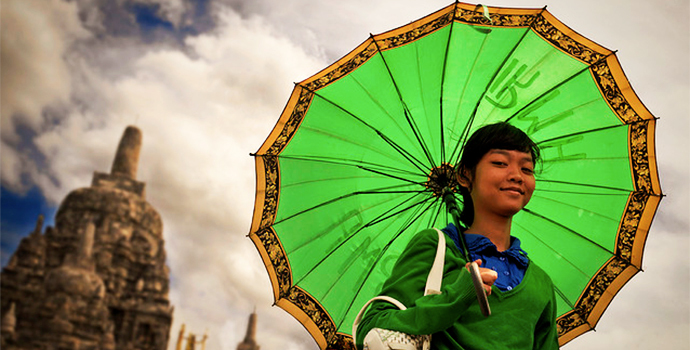 Please note: Rooms in your homestay are basic, without AC (but it will be cooler weather). You will be sharing a standard Indonesian bathroom (squat toilet) with hot and cold water. You may want to consider bringing a light sleeping bag. Today you will wake up early around 4:30 to transfer to a viewpoint where you can watch the stunning sunrise over the active Bromo volcano. Afterwards we will hike to the volcano’s breathtaking steaming caldera before heading back to the homestay for a shower and to say goodbye to your host family. After freshening up we will head out for a full-day transfer about 8-9 hours to the Ijen Volcano area through small, traditional villages where you can get glimpses of East Javanese daily life. Along the way we will stop at local a fishing village in Bletok Beach, where your group can learn about fishing and preservation process, see how they make their staple (and quite stinky) shrimp paste, observe the life of local people and try traditional snacks & drinks. After a long day of adventure, enjoy a well-deserved Indonesian dinner at the hotel. Overnight in Ketapang Indah. Start your day with an early pick-up around 1am for a once-in-a-lifetime opportunity to see the ethereal blue glow of the Ijen Crater. Admire the dazzling, electric-blue fire that can often be seen burning upward into the sky, glowing naturally from the sulfur-rich volcano. As the sun rises, the blue fire will turn to yellow and then fade away. Resting on the edge of the crater (2883m) you will have the opportunity to take pictures and enjoy the breathtaking panorama of this kilometre-wide, turquoise crater lake as the sun rises. You will also have the opportunity to contemplate the arduous job of the sulfur miners that go up and down the crater carrying loads of up to 80kg on their shoulders and wearing flip flops on dangerous paths without much safety protection. Around 9am we will head back to the hotel for breakfast and some rest before a noon pick-up from the hotel and transfer about 2.5 hours to Pulau Merah, a beautiful beach town and backpacker destination with the most famous surfing in Java. For dinner we’re having a beach barbecue with fresh seafood right out of the ocean to unwind in paradise after a long and unforgettable day. Overnight in Pulau Merah. Safety Note: Please be aware that there are health risks associated with breathing the fumes that are emitted by the Ijen crater. We will be providing face masks to protect you from the fumes, but all guests wishing to participate will be required to sign a waiver. Anyone who does not wish to participate can go on a separate crater lake hike beginning at 6:30am. Please note: Tonight’s accommodation will be in a very simple guest house. The rooms have air conditioning, but has a shared Indonesian-style bathroom (with a squat toilet). Early this morning you will have a very simple breakfast of bread, jam, eggs, and coffee at your guesthouse before taking a transfer to beautiful Pemuteran in West Bali. Enjoy the afternoon to rest at your beachfront hotel and enjoy the stunning nature. Swim, soak up the sun, and borrow/rent some snorkelling equipment from the hotel to see the incredible marine life of Bali. For dinner you and your friends can opt to eat at the hotel or head to a warung, a small locally-owned cafe typical to this area. Overnight in Pemuteran. Today you will have a fantastic day trip in this incredible island paradise. Head to stunning Menjangan Island for incredible snokelling in protected waters where you can see an amazing variety of colourful corals and fish. After working up an appetite in the water we’ll enjoy a box of lunch fried rice or fried noodles, typical Indonesian fare. After getting our fill of fun in the sun we’ll drive along the shore of the sparkling Bali Sea and then into the mountains on small curvy roads, stopping to snap photos of the beautiful views. Then jatiluwih unesco rice terraces. We’ll make a stop at the UNESCO-listed Jatiluwih Rice Terraces, world-renowned for their breathtaking emerald-green beauty. On the way to Ubud, our final destination, we will visit a traditional fruit and vegetable market in Bedugul, where you can try all sorts of produce you won’t find anywhere else. We will enjoy dinner at a local restaurant before heading to a local shisha lounge where we can kick back and listen to local live music. Overnight in Ubud. After enjoying breakfast you’ll head out with your tour leader to see some of Bali’s innumerable incredible highlights. 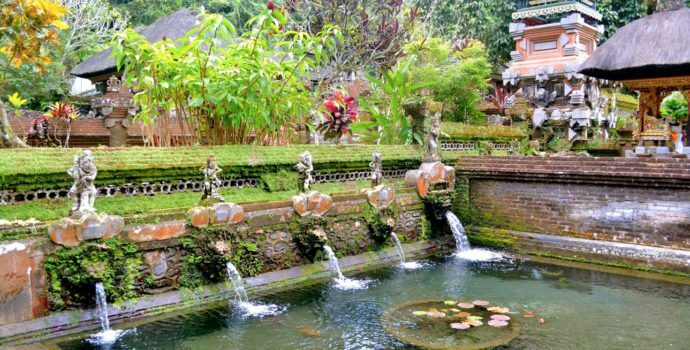 This journey through Bali begins with Tirta Empul, a sacred site with holy springs and baths flowing throughout the complex. Priests and locals alike use this water to perform ceremonies year round. The Balinese believe in the water’s curative and rejuvenating power and, as consequence, take ritual baths here along with prayer. The next destination is Gunung Kawi, home to thousand-year-old royal tombs and one of the Bali’s first Buddhist monasteries. An exceptionally beautiful place situated in a ravine surrounded by green rice fields, Gunung Kawi will take your breath away. 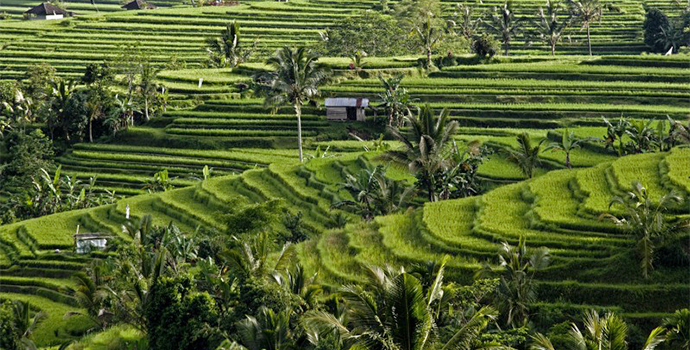 Afterwards we will take you to Tegalalang, where you can marvel at one of the most beautiful rice terraces in Bali. A traditional Balinese lunch, with a large communal rice dish surrounded by flavourful local delicacies will be served in boutique restaurant in Ubud. Your last stop today of the tour is the Temple of Hanuman, surrounded by Monkey Forest Sanctuary, where you can meet hundreds of these incredible primates. After the tour, we will walk around Ubud and get to know the city, made famous for its yoga and spirituality by the popular book and movie Eat, Pray, Love. The town is filled with small and charming restaurants to try out for dinner. Overnight in Ubud. Rise early this morning for a transfer north to the base of Mt. Abang, where you will begin your 4-hour trek through the lush rainforest. While Abang is not as famous as the local Mr. Batur, it is equally as beautiful and provides a far less crowded and more off-the-beaten-path experience. Enjoy the serenity of the quiet volcano and the spirituality of a quiet moment in nature. Reach the summit to watch the stunning sunrise and an unforgettable view of Bali and Mt. Batur as you enjoy your boxed breakfast. After the descending enjoy a well-deserved soak in the natural hot springs located just on the edge of a breathtaking lake. There’s no better place to kick back, relax, and appreciate Mother Nature. We will enjoy a buffet-style lunch with a gorgeous view over the Kintamani Crater before being transferred to Canggu, where you’ll check into your new accommodation and enjoy plenty of time to rest, freshen up, and get ready for your last night with your new friends in incredible Indonesia. In the past, Canggu was a quiet surfing spot but recently it’s become a wonderful place to hang out, party, and meet other travellers. This evening your Bamba Happiness Leader will take you to Deus Restaurant, a local gem with a wide variety of dishes inspired by cuisine from all over the world. After dinner we will drive to Petitenget area, the most popular area for nightlife in all of Bali. Enjoy your last night out on the town with your group and make it count! Our driver will be available for you until 2am, but if you’re not ready to call it a night you can always take a taxi back to the hotel. All good things must end. Today your adventure comes to a finish after check-out. Make sure that you exchange contact information with your new friends, you’ll have a lot to reminisce about! We wish you a safe journey onward. Airport Transfers, Optional Activities, Other Meals/Drinks, Tips, Personal Expenses, Travel Insurance, International Flights.